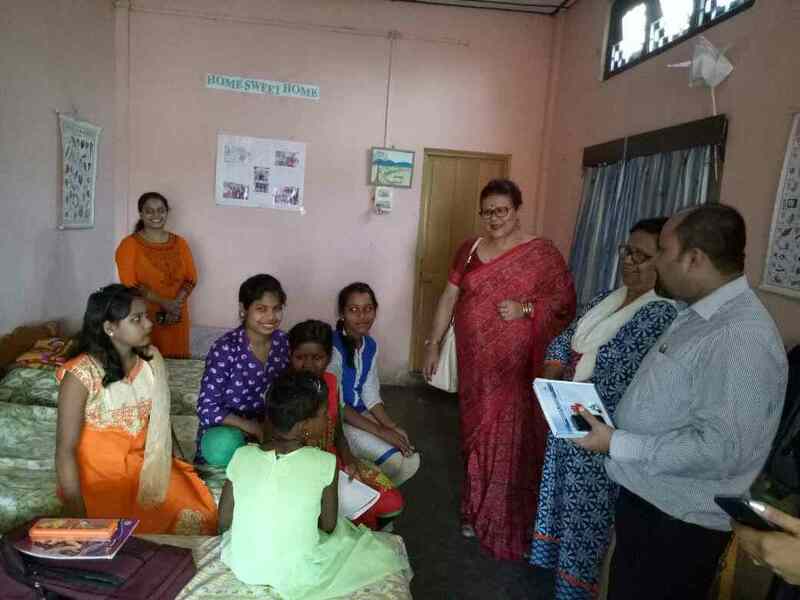 On 28thof June 2017, a team of the Assam State Commission for Protection of Child Rights (ASCPCR) made a surprise visit to the Vagrant and Observation Home in Fatasil Ambari. The team comprised of Chairperson Dr. Sunita Changkakati, Mrs. Rupa Hazarika (Member, ASCPCR), Mrs. Indrani Tahbildar (Member, ASCPCR) and Mr. Maharishi Goswami (Technical Consultant). The Commission recorded its findings and wrote to the NCPCR for immediate action, on July 3rd. •	Only one watchman working 24 hour shift as the other guards have left their job due to untimely payment of salary. •	The Assistant House Father joined the team and mentioned that there has been no Senior House Father appointed. He has been solely looking after all the children of the home. •	The team of ASCPCR interacted with children of the home from various age groups. Different viewpoints and complaints were made by the children. •	That the children especially those who stay in the Transit home are restricted to stay inside their dormitory. •	The children complained that the guard keeps them locked up. They are not given optimum freedom to watch TV or play outdoor sports. Even their food is being served in the dormitory instead of serving in the dining hall. •	That the water supply to the bathrooms is not clean. •	Some children complained that they have developed skin allergies due to the untreated water they are provided with. •	The bathrooms are not adequately cleaned. The bathrooms have a foul smell which clearly indicates that the bathrooms are not hygienic enough for children to use. During the visit, water logging was observed in the basin and bathroom of the dormitory due to blockage of the outlets. •	A child staying for over a year in transit and not attending school indicate towards the problem of unequal categorization of children in the home. Such revelations by the children themselves point to the clear violation of the Right of Children to Free and Compulsory Education Act 2009 by the Children Home authorities. •	There is no special cell for the children with special needs. During the visit the Assistant House father showed a child with special needs who was sleeping with other children. While in Article 35 of the Juvenile Justice (Care and Protection of Children) Model Rules, 2016 it is stated that ‘the environment in an institution shall be free from abuse, allowing children to cope with their situation and regain confidence. Every institution shall have the services of trained counselors or collaboration with external agencies such as child guidance centers, psychology and psychiatric departments or similar Government and non-Governmental agencies, for specialized and regular individual therapy for the child’, it was found that children staying in the Vagrant and Observation Home reported opposite feelings. It may be mentioned here that in Article 36 of the Juvenile Justice (Care and Protection of Children) Model Rules, 2016 it is stated that ‘Every institution shall provide education to all children according to the age and ability, both inside the institution or outside, as per requirement. There shall be a range of educational opportunities including, mainstream inclusive schools, bridge school, open schooling, non-formal education and learning where needed’. However in this home it was found that all children do not have equal access to education and are not allowed to go to school which is again a violation of the Right of Children to Free and Compulsory Education Act 2009 by the Children Home authorities. •	The only classroom that exists within the children home premises is comparatively small given the ratio of children staying in the home. •	The vocational training room which is half the size of the classroom was in a mess, with only the carrier frame of a sewing machine which was not maintained properly and was used to stack old drawing sheets made by children. •	The campus which is spread over 12 bigha lands is not secured from all sides. The swamps near the staff quarters make for an easy escape route for children who want to seek freedom by running away from the children home. •	There is only one Ayaa/helper to wash the clothes of the children. The clothes and bed sheets provided to children did not look neat and tidy enough. Many children seemed to have skin rashes and did not look like their cleanliness and hygiene is being looked after with significant interest by the home authorities. •	There is a substantial lack in providing care and protection to the children of the Vagrant and Observation Home by the home authorities. Clearly, there is a vacancy for a lot of the posts as prescribed by the JJ rules which are yet to be filled. •	Selection of personnel for various positions in the home needs to be done as early as possible for better administration and for a more positive conducive environment which may facilitate growth and creativity of the children. •	It may be pointed out that the home authorities need to cater to its hygiene and cleanliness issues at the earliest. •	The classrooms and vocational training center need to be developed further in terms of space and resources. •	Separate unit for the children with special needs must be developed along with hiring staff that are trained to deal with or have an understanding of children with special needs. •	Special attention must be given to the children in terms of providing education and vocational training. •	The absence of an in house paramedic and an art and craft instructor (part time) needs to be addressed quickly. •	More guards should be appointed. •	House father should be appointed at the earliest since it is not possible for one Assistant House Father to monitor all the children staying in the home. •	There is a need for more Ayaas/helpers for cleaning the laundry of the children as one Aya is not sufficient for cleaning both clothes as well as the bedrolls of all the children.